M- told us about this tourist attraction. She said everyone who goes to Portland goes to Voodoo Doughnut. It’s quite funny though, because she’s lived there for 10 years and she just recently went here for the first time. She went with W- and I to here for her second time. I would suggest going to their website and deciding what you want because the menu is so tiny! Yes, I have a clear picture of the menu, but you can’t read it when you are at the back of the shop! Voodoo gets extremely popular apparently too! This entry was posted in Food Reviews and tagged breakfast, desserts, doughnuts, pastries, portland, reviews on August 7, 2011 by Krystal. This past week has been so busy at work that I am so tired right after. What makes the time at work more bearable during this busy time are the yummy treats. Last week, my supervisor brought back christmas donuts from Krispy Kreme after lunch, and they were so fresh and delicious! Yum! 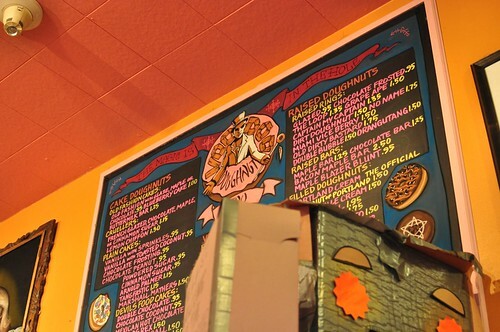 This entry was posted in Food Reviews and tagged doughnuts, food, stroopwafels on December 15, 2010 by Krystal.